When search engine giant Google started planning and then building software-defined networks more than a decade ago, the term did not even exist yet. Over the years, because of the competitive advantage that technology brings to Google, the company has been very secretive about its servers, storage, and networks. 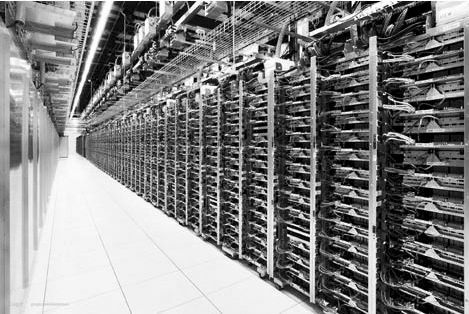 But every once in a while, though, Google gives the world a peek at its infrastructure and, in a certain sense, gives us all a view of what the future of the datacenter will look like. Amin Vahdat, a Google Fellow and technical lead for networking at the company, did just that so this week for the datacenter-scale networks that Google uses to lash its vast farms of servers and storage together into a distributed computing platform. Google is not just talking about its networks as a kind of altruism, but rather as an indirect means of showing potential customers for its Google Cloud Platform that it has the best infrastructure on the planet and that companies should move their public cloud workloads there. The way that Google has talked about its homegrown networks publicly is in reverse order to the way they were actually built. Back in 2013, Google revealed some of the details on its B4 wide area network, which links its global datacenters together for data replication and workload sharing, and last year, Vahdat unveiled details on the Andromeda network virtualization stack that rides atop Google’s network fabric and exposes network functionality to customers using its Google Compute Platform public cloud. This year, Vahdat’s keynote presentation at the Open Networking Summit discussed why Google had to start building its own switches and routers to support its datacenter-scale networks and also the software that creates the network fabric and manages the whole shebang. This is not a complete list of all of the network generations at Google; these are just the high points. The latest Jupiter switches and their related networking software stack, which is distinct from prior generations of networking software developed by Google, was not discussed in much detail. Vahdat said in his ONS presentation, which you can see here and which he blogged about there, that Google would be publishing a paper on the Jupiter datacenter networking stack in August in conjunction with the SIGCOMM conference that will be hosted by the ACM in London. Other important elements of the Google network, we learned, include the Google Global Cache, which provides the edge presence for the company’s applications, and Freedome, a campus-level interconnect which links multiple datacenters in a single region together and which was the foundation for B4. Both Freedome and B4 are derived from the warehouse-scale networking infrastructure that has gone through five generations, internally known by the names Firehose (there were two of these), Watchtower, Saturn, and Jupiter. Starting from the time when Google moved to its first homegrown switches in 2006, the traffic generated by its servers has grown by a factor of more than 100X. The other issue, explained Vahdat, is that back in 2005 or so, the networking equipment vendors were still thinking at the box level when Google was thinking at the datacenter level. Switches and routers could be deployed in fabrics of a sort, but they were still managed individually, using a command line interface and requiring human interaction. Adding to the complexity of the situation is the fact that Google is always adding servers, storage, and switching to its datacenters and the network fabric has to be able to allow for the mixing of old and new technologies. Google can’t turn off a datacenter to replace all of its gear in one fell swoop; old stuff has to work with new stuff. All of this needs to be more flexible and at the same time more defined, and this all comes back to the central control theme we see time and again in Google’s infrastructure management software. “We needed lots and lots of paths between each source and destination available to use to achieve the bandwidth that we did,” said Vahdat. “Existing protocols did not have that at the time. The Internet protocols were about finding a path between a source and a destination, not necessarily the best path and not many paths.” And so Google created its own protocol, called Firepath, and that routers data between servers and between servers and storage and to the outside world from within Google’s datacenters. The servers are linked to top of rack switches, which are made from merchant silicon chips, most likely Broadcom but very possibly other makers of switch ASICs have won some business with Google. A pod of server racks are linked to each other through an edge aggregation switch, which is based on the same ASICs as in the top of racker, and then these aggregation switches are lashed together through a set of non-blocking spine switches that are also based on the same chip. Forget this old-fashioned idea of having a big, expensive core switch or router at the heart of everything. This is precisely the way Facebook is building its own Wedge and 6-pack open switches today – nine years after Google did it. The amazing thing is that Facebook has not done this already, but as vice president of technical operations Najam Ahmad explained to The Next Platform back in March, you have to hit a certain scale before Clos networks, compatible iron up and down the network stack, and a homegrown switch operating system make sense. But Facebook is absolutely following in Google’s footsteps, and it is bringing its Open Compute posse with it this time, too. Vahdat did not provide a slide showing the Firehose 1.1 network that was actually deployed, but did say that it was not tied to the servers so tightly and that it was deployed in stages side-by-side with the old router and rack method until the new approach was shown to work. The machines shown above are four of the edge aggregation switches based on the Watchtower design. Again, the Clos network has three tiers and a tremendous amount of scale. The edge aggregation switches have 288 ports, but don’t try to count them all from the picture. While this history lesson is all interesting, what is more interesting is contemplating what Google is doing right now. The Jupiter equipment came out three years ago, give or take. The fact that Google was one of the instigators of the 25G Ethernet Consortium that essentially forced the IEEE to build switches the way that it and Microsoft wanted, means that Google is probably in the process of developing a new stack of hardware based on 25 Gb/sec and maybe 50 Gb/sec links to servers and storage and 100 Gb/sec links across the aggregation and spine layers of its networks. This will be another step function up in bandwidth for the Google datacenters, and giving it perhaps a huge advantage compared to cloud builders who have invested heavily in 10 Gb/sec on the server and 40 Gb/sec on the backbone. The biggest keep getting bigger. Interesting that no one has looked at the currently disclosed Jupiter networks, which are all 40G to the hosts by now, and the delivered performance of the google cloud network (which was sub-par even for 10G). Same can be said of the Amazon and Microsoft networks. What’s going on here? At one point Google Cloud was 10x worse than the baremetal network they are hyping!